According to the Environmental Protection Agency, greenhouse gas emissions from transportation accounted for 26 percent of total U.S. greenhouse gas emissions in 2014, making it the second largest contributor behind the electricity sector. Greenhouse gas emissions from vehicles are dependent on three factors: the vehicle, the fuel and the driver. The driving portion holds potential for substantial emission reductions at minimal cost, but is often overlooked. As part of Ford’s commitment to reducing its vehicles’ environmental impact, the company has released a series of driving tips for saving fuel and helping to reduce drivers’ environmental footprint. 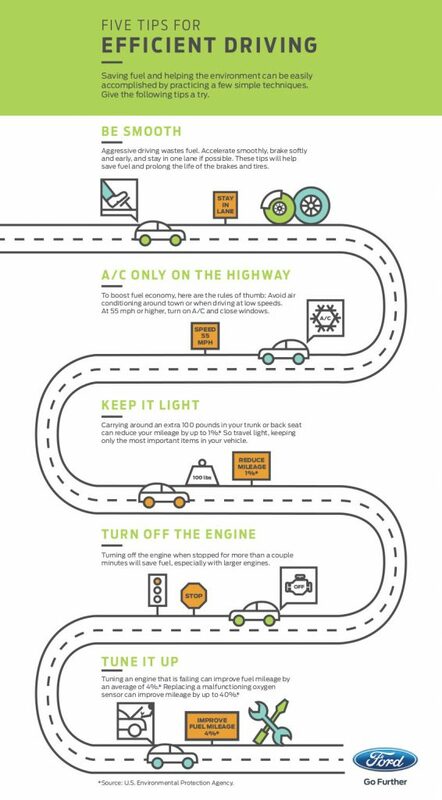 By following these simple steps, drivers can save fuel, prolong the life of their vehicle and its parts, and reduce their environmental impact. Be smooth: Accelerate smoothly, break softly and early and stay in one lane, if possible. Use the A/C only on the highway: Only turn the air-conditioning on at speeds of 55 mph or higher. Keep it light: Don’t travel with extra weight in the back seat or trunk, travel light and keep only necessary and important items in your vehicle. This can reduce mileage by up to 1%. Turn off the engine: Turn off the engine when stopped at stoplights or stop signs for more than a couple minutes. Tune it up: Keeping your vehicle tuned up and in proper working order can improve fuel mileage by an average of 4%.